It’s amazing where you can get on the train in less than 90 minutes from London. 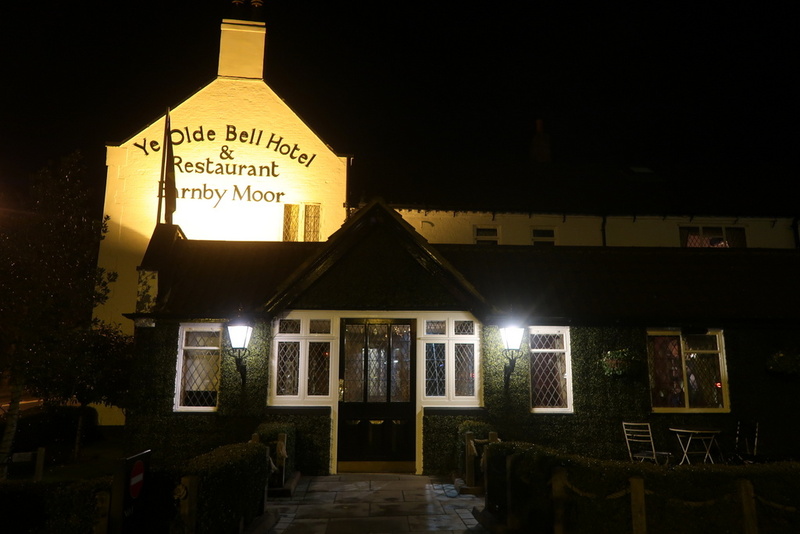 Sitting midway between London and Edinburgh in the village of Barnby Moor, Ye Olde Bell Spa Hotel and Restaurant is just a short cab ride from Retford railway station. 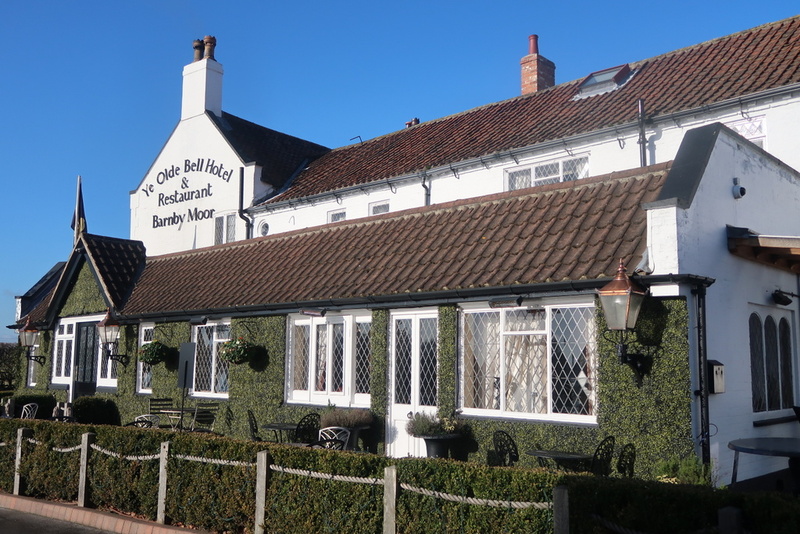 With Sheffield, Doncaster, Lincoln, Nottingham and the rural idyll that is Sherwood Forest on the doorstep, Ye Olde Bell hotel is ideally suited for anyone visiting the region. Owners Paul and Hilary Levack have artfully restored the hotel’s AA 4-star rooms, suites and lodges creating a stylish country house hotel feel with oak panelling, quirky antique furniture, roaring log fires and sparkling chandeliers. Our bedroom was spacious and comfy with a decadent four-poster bed, gorgeous fabrics, a decent sized. bathroom with a great power shower, flat screen television and free wi-fi. I loved the plate of fruit and the great selection of teas and coffee. The hotel also has four individually styled suites styled with grand beds, antique furnishings and spacious contemporary bathrooms. Situated next to the spa, the luxurious 2-storey lodges are perfect if you have a larger group to accommodate. After unpacking we slipped down into the stunning art deco bar for a much needed G&T before dinner. Using locally sourced produce from Nottinghamshire, Yorkshire and Lincolnshire, the hotel kitchen has been awarded an AA Rosette. 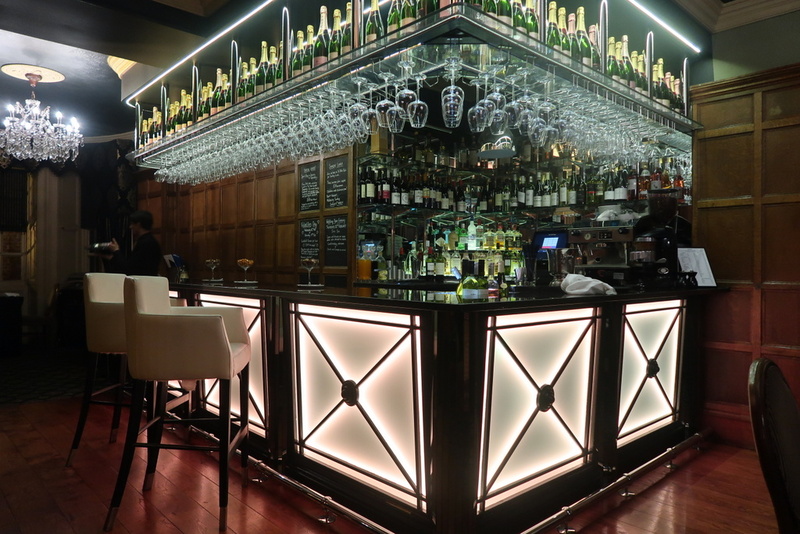 We were dining at the stylish Restaurant Bar 1650 but there is also the more casual St Leger Bistro-by-the-Bar if you are in the mood for something more casual. We perused the menu whilst nibbling on moreish red onion and sundried tomato rolls and sipping a glass of the rather acidic house white. Starters were excellent. 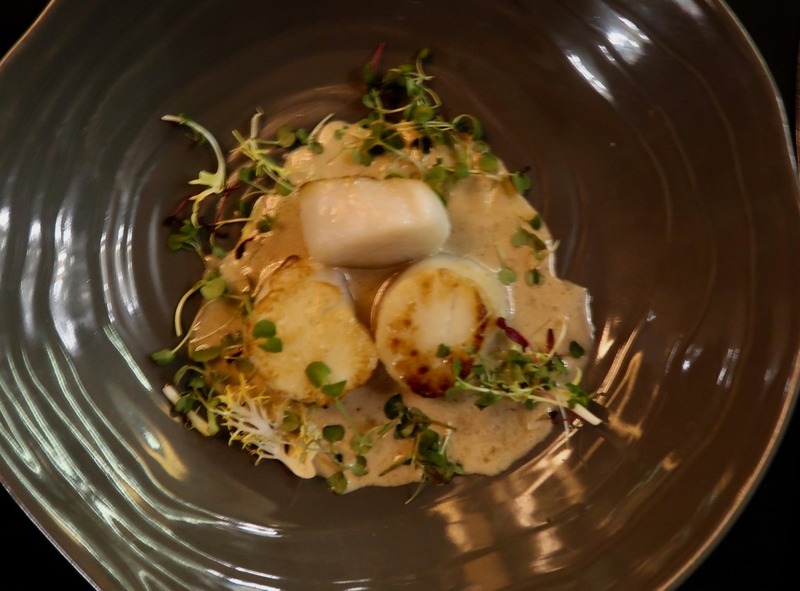 An elegant dish of mixed beetroot came with a creamy goat’s cheese and an ash and rye cracker and beautifully cooked pan-fried scallops were served with a delicate chestnut velouté. 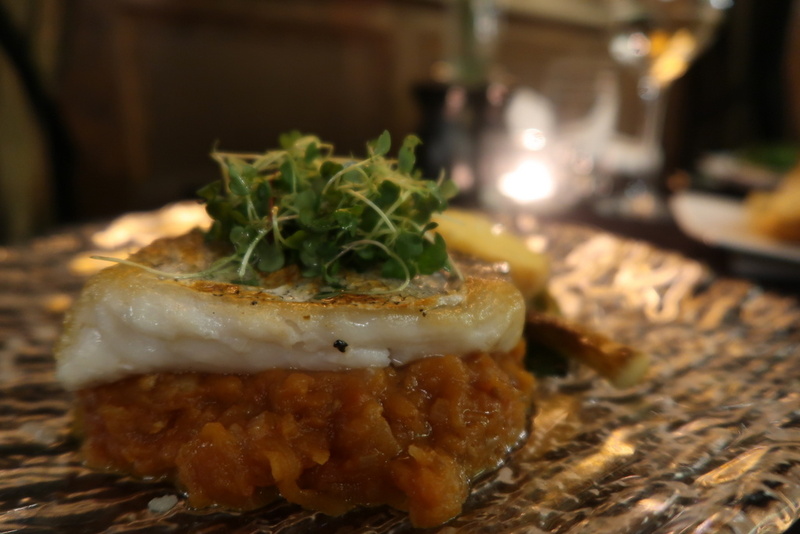 I’m always pleased to see hake on a menu in the UK and a meaty fillet of this underrated fish came perched on a mound of tomato jam and was plated with dill oil, saffron arancini, baby leeks with a beurre noisette. 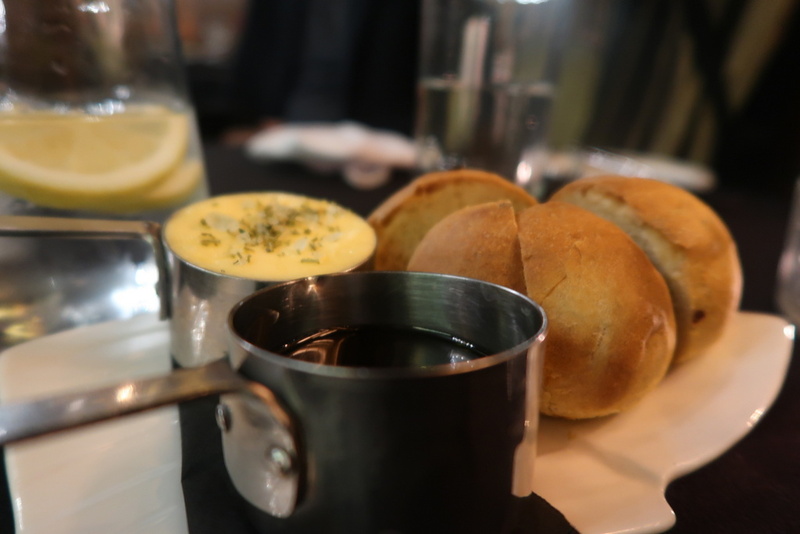 I loved this dish –it was a perfect plate of winter sustenance. 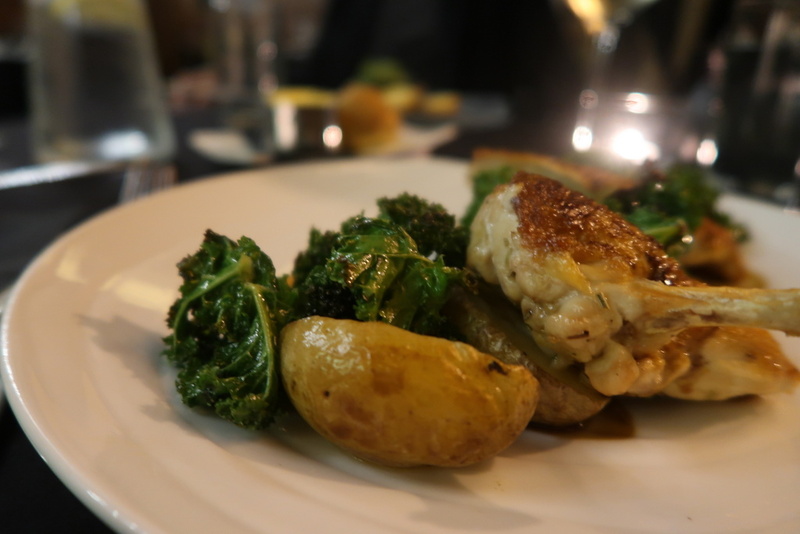 Tender, moist breast of corn-fed chicken with crisp roasted kale and salt baked new potatoes was sweetened by a rich balsamic jus. Rhubarb crumble was a perfect realisation of the dish with a wonderfully smooth custard. 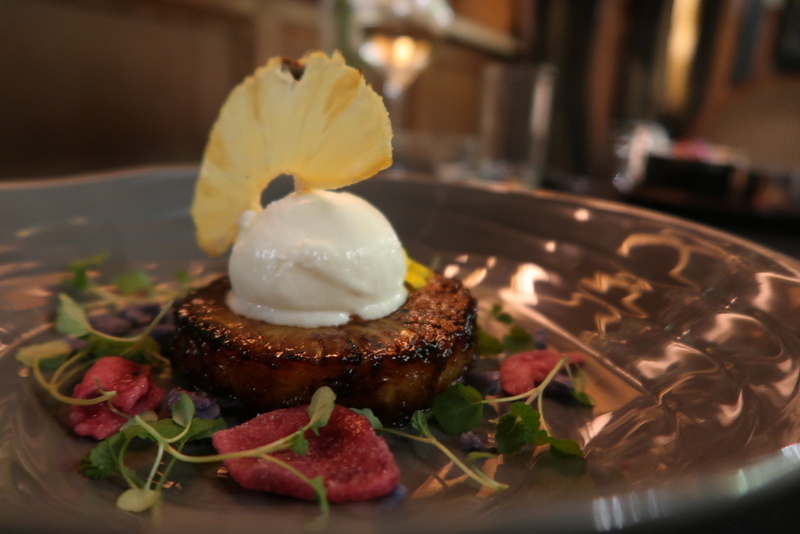 But my favourite of the desserts was caramelised roasted pineapple with a yoghurt sorbet and delicious golden raisins soaked in luscious PX sherry. After a great night’s sleep, we were back in the restaurant for breakfast. 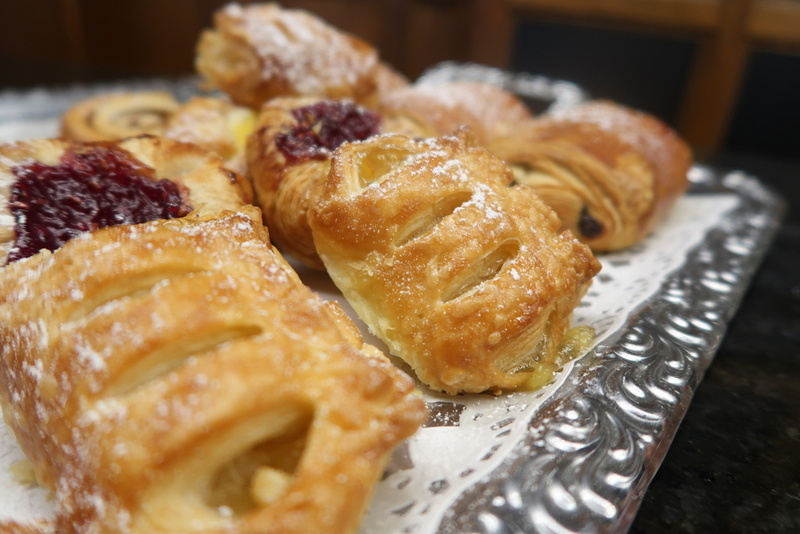 There was a great range of pastries, cereals, fresh fruit and juices to choose from as well as cooked options. I can recommend the haddock with poached eggs. It was a moist and meaty fillet – delicious mixed with the bright orange egg yolks. 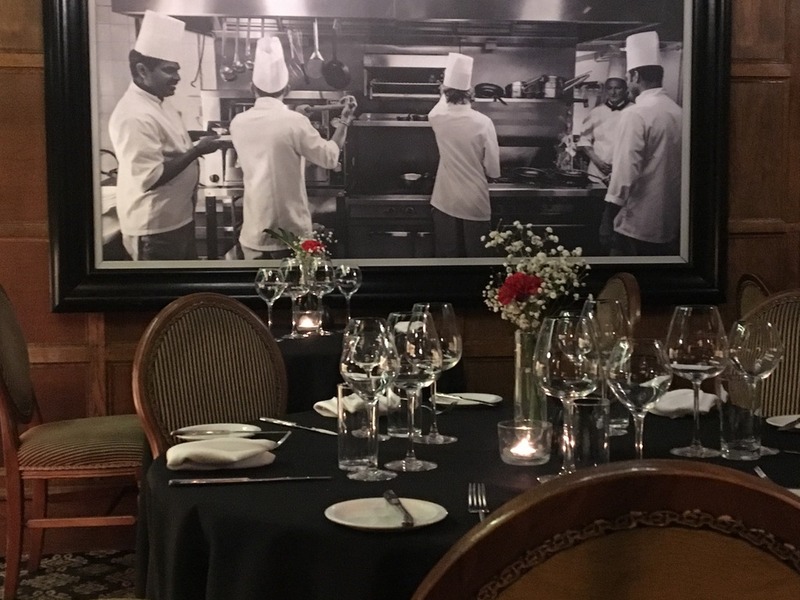 With a menu that includes some good looking steaks, burgers, flatbreads and fish and chips, and mains priced around a very reasonable £16 mark it’s no wonder that Restaurant Bar 1650 has become a Nottingham destination restaurant with some fine cooking going on in the kitchen. 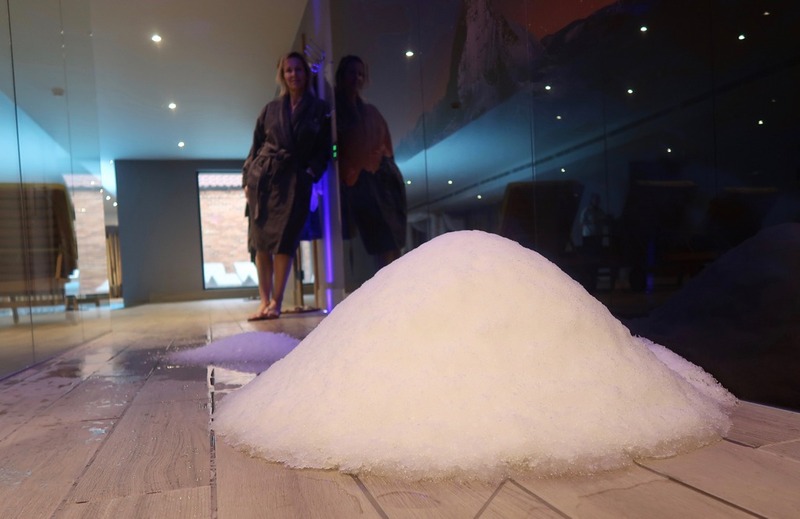 The hotel has recently opened a rather beautiful spa. They offer tailored treatments and 10 thermal experiences which have been sourced from around the world. 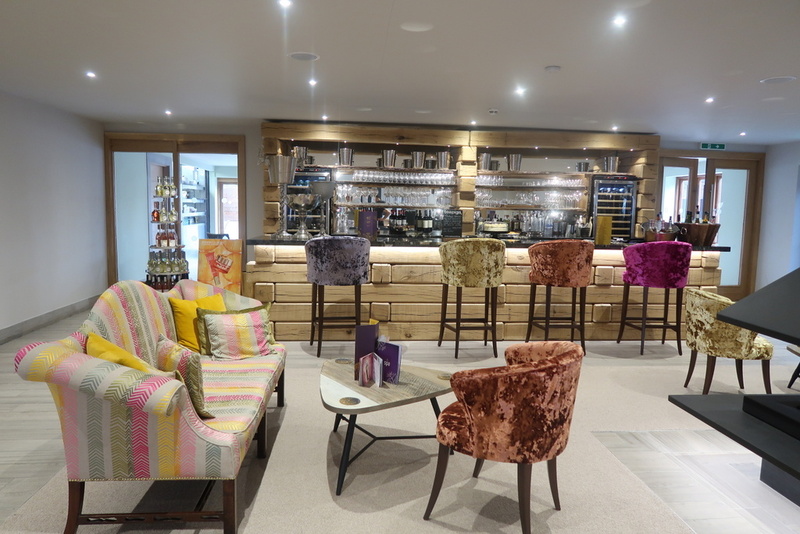 You can also chill out and eat and drink in their luxurious relaxation lounge, Herb Garden Brasserie or Terrace – and they even have a hairdresser! 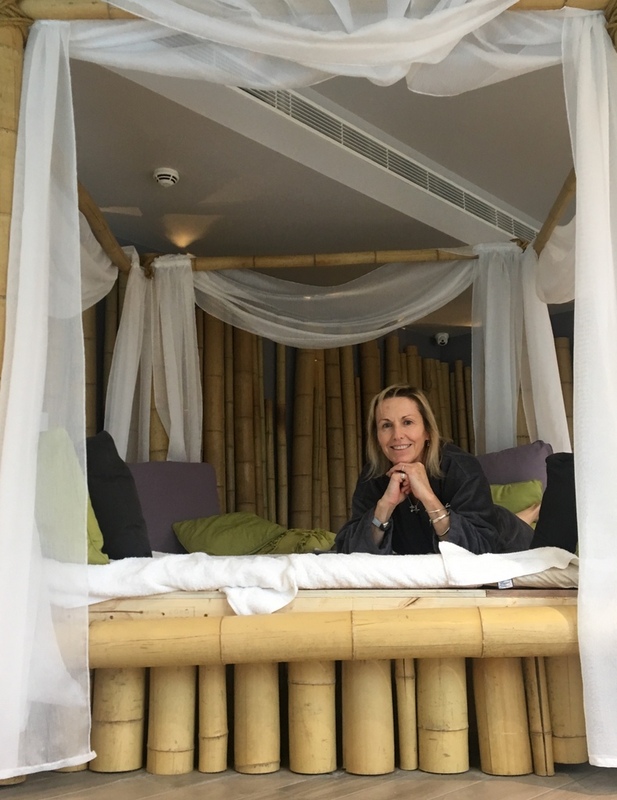 We had been invited to experience the thermal experiences, but before my friend and I took the plunge, we were booked in for the Experience Massage. Using Swedish and Chinese approaches and Germaine de Capuccini products it was delivered by the wonderful team of experienced therapists Clare and Abby. They were brilliant at destressing us by getting rid of all those knots and aches and pains that build up. We came out feeling fab! There is a stunning indoor/outdoor vitality pool with a 60s kitsch chalet style outdoor heated area- perfect for kicking back with your friends. 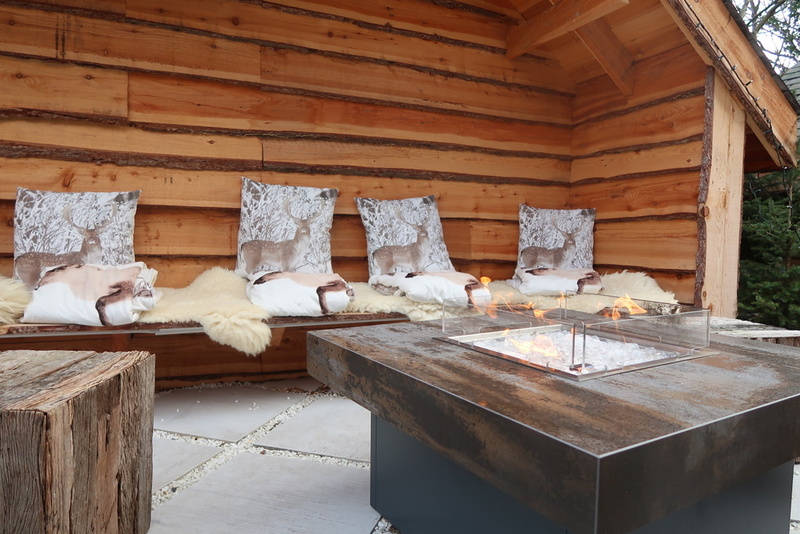 I loved the cosy Nordic area with fur rugs and a roaring fire if you fancied keeping really warm. But the main attraction in the spa at the hotel is the Thermal Area containing an amazing variety of thermal experiences. There are three saunas including the 80-degree alpine sauna using alpine wood with pine essence, a herbal laconium and a Stone Bath ™ – the only one in the U.K – where you see the hot stones plunging from the fire into the water to create a hybrid sauna/steam room. I loved the incredible and unique snowstorm experience – brrrrr!…and then there is the extraordinary Shower Walk – stroll through warm tropical rain entranced by the plangent calls of birds of paradise – then immerse yourself in cold rain with the sound of an alpine creek burbling by – next is a warm summer storm with the sound of thunder – followed by a cold mist with the sound of a sea breeze…finish with the cold bucket shower! The steam bath has 100% humidity and is great for the metabolism and immune system, and the salt inhalation room creates a marine climate at 25-30 degrees and helps with respiratory problems, unblocks sinuses and relieves allergies. 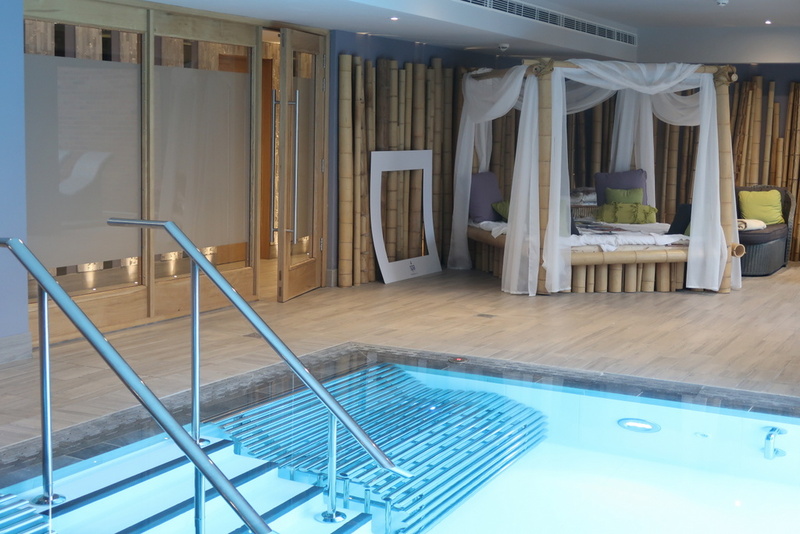 I love the luxury of our day in the spa, it really is the perfect way to unwind from the stresses and strains of a busy life, and an ideal place to go for a celebration or treat with a friend or your partner. 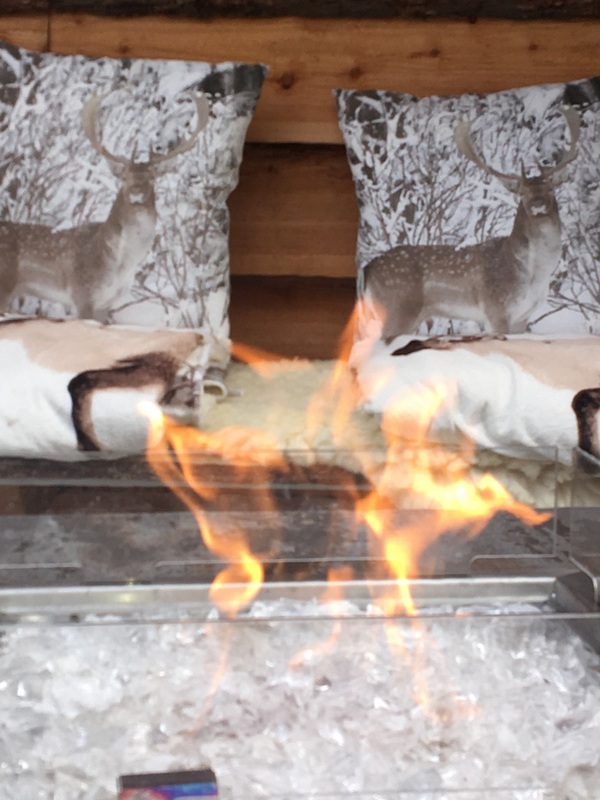 Here at Ye Olde Bell hotel, they have created something rather special. 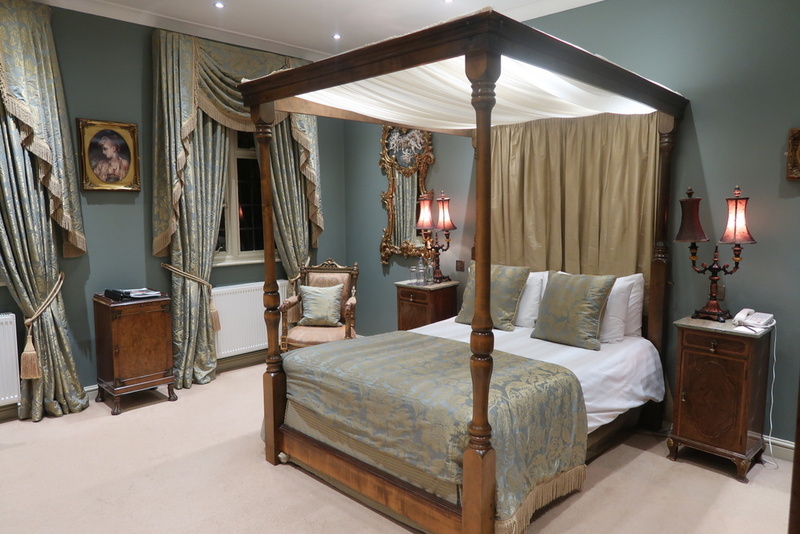 But, with great food, its brand new spa and lovely gardens Ye Olde Bell is the perfect Midlands boutique hotel for a short break or longer and with a fast train to London, you should need no excuse to visit. Such a classy joint. Surprisingly I like the rooms wall colour. Normally, I would say it’s too dark but it works well here. But those spa options. Damn. A whole thermal area with types of spas I never heard of. 80-degree alpine sauna with alpine wood oh yes please. It sure does look like you and your friend had a fabulous time here. Ye Olde Bell Spa hotel seems like has it all. From the sweets that made me crave for one, the kitchen with world class cuisine and the Thermal Area with an amazing thermal experience! I especially love the room, so elegant and simple! And I would love to get myself a glass of wine or a sangria at the beautiful bar! Looks attractive to me! It’s calling my name, eh! 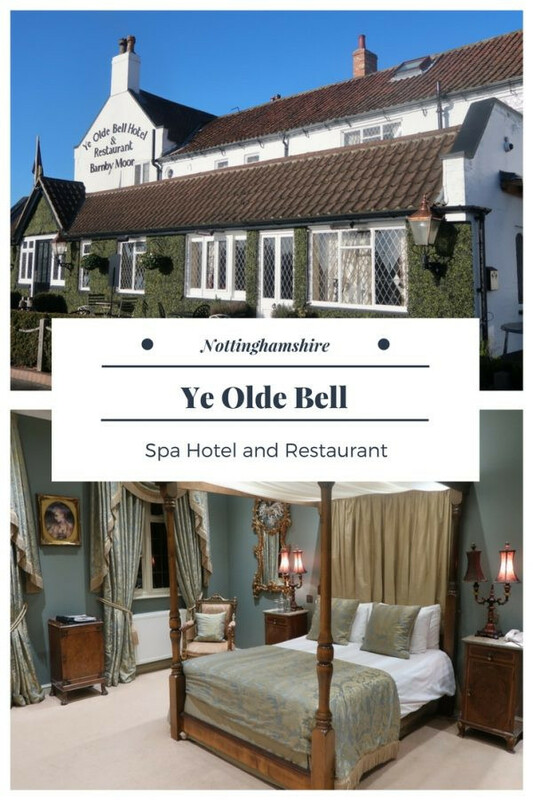 Ye Olde Bell Spa Hotel and Restaurant looks like it would make for a beautiful retreat from London – I love the country manor look to the rooms and interior, and the kitchen sounds divine – Rhubarb crumble makes me drool every time lol! And your day in the spa sounds fabulous, the thermal area sounds quite unique. All in all, seems to be the perfect retreat! What a glorious old hotel. That four poster bed, what a wonderful bedroom. But then I kept reading and it just kept getting better and better. The food looks amazing and then, then there is snow!!! Wow, my senses would be in heaven with all that stimulation. I think of all the areas such as the pool, restaurant, bar and spa and the outdoor terrace, I love the rooms the best! They are done so artfully, with the antique furniture. Looks so cosy and charming! Seems like you stayed at a fantastic hotel, thanks for the recommendation.